A common error when using a durometer is to imbed the foot of the gauge into the specimen by pressing down with excessive force. All instruments are made in accordance with ASTM D-2240. This standard states that for types A, B, and O the gauge should be pressed onto the specimen with a load of 1 kg. The Constant Load Weight for gauges with an 822g springload (types A, B, O) slides onto the lower barrel of the gauge, gives it a wider foot, and raises the mass of the gauge to the suggested 1kg. 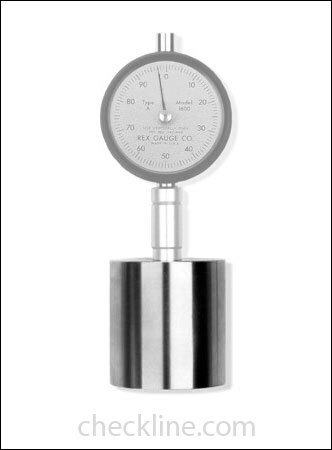 With the load weight on the gauge, all the user has to do is set the gauge on the test specimen - no further pressure is necessary. Thus the Constant load weight eliminates the human error that would otherwise occur due to users pressing on excessive or inconsistent force. Constant Load Weights are precision CNC machined from stainless steel and are polished and calibrated by skilled craftsmen. in the USA. As stated above, a common error when using a durometer is to imbed the foot of the gauge into the specimen by pressing down with excessive force. All Rex instruments are made in accordance with ASTM D-2240. This standard states that for types OO and OOO the gauge should be pressed onto the specimen with a load of 400g. The Rex Constant Load Weight for the type OO and OOO gauges screws onto the top of the gauge and raises the mass of the gauge to the suggested 400g.